SAIPAN's keel was laid by Ingalls Shipbuilding Co., at Pascagoula, Mississippi on 21 July 1972. SAIPAN was christened on 20 July 1974, by Mrs. Isabelle Middendorf, wife of former Secretary of the Navy, J. William Middendorf, and commissioned as a U.S. Navy vessel on 15 October 1977. Her first Commanding Officer was Captain F. W. Johnston. SAIPAN's operational career began in July 1979 when she was diverted from Fleet Refresher Training to "Special Contingency Operations" for possible non-combatant evacuation of American personnel from Nicaragua during that country's civil war. In May 1980, SAIPAN was underway augmenting U.S. Coast Guard efforts to assist Cuban refugees crossing the Straits of Florida to the United States. On 25 August 1980, SAIPAN departed Norfolk for the first Mediterranean deployment by a LHA, and on 3 September 1981, SAIPAN deployed for her second tour in the Med. During that deployment, SAIPAN visited or operated in seven different countries on three continents, transited the Suez Canal, and participated in Exercises OCEAN VENTURE, DISPLAY DETERMINATION, BRIGHT STAR and NATIONAL WEEK. From August 1982 through July 1983, SAIPAN was in the Norfolk Naval Shipyard in Portsmouth, Virginia for her first scheduled, complex overhaul. In September 1983, while undergoing Refresher Training at Guantanamo Bay, Cuba, SAIPAN was diverted to participate in Operation URGENT FURY off Grenada. SAIPAN then set sail for her third Mediterranean deployment on 22 January 1985. During this deployment, she steamed more than 32,000 miles, logged over 6,700 safe aircraft landings, and visited ports in three countries. After a maintenance period in Norfolk Naval Shipyard, Portsmouth, Virginia from October 1985 to February 1986, SAIPAN sailed to Guantanamo Bay to complete Refresher Training. Amphibious Refresher Training was held later in May off the Coast of North Carolina with SAIPAN achieving a 99.97 overall grade, the highest score ever achieved by any amphibious ship. On 17 August 1986, SAIPAN departed on her fourth Mediterranean deployment. Extended briefly in the Eastern Mediterranean for contingency operations, SAIPAN returned to Norfolk on 24 February 1987. From 17 March 1990 through 17 September 1990, SAIPAN was deployed to the Mediterranean and conducted the evacuation of approximately 1,600 civilians from war-torn Liberia in support of Operation SHARP EDGE. From 17 September 1991 to 17 March 1992, SAIPAN deployed to the Persian Gulf as a unit of ARG 3-91 in support of Operation DESERT STORM. During 1993, SAIPAN was out of home port 245 days. SAIPAN again deployed to the Mediterranean on 17 March with the 26th Marine Expeditionary Unit in support of Operations DENY FLIGHT and PROVIDE PROMISE. 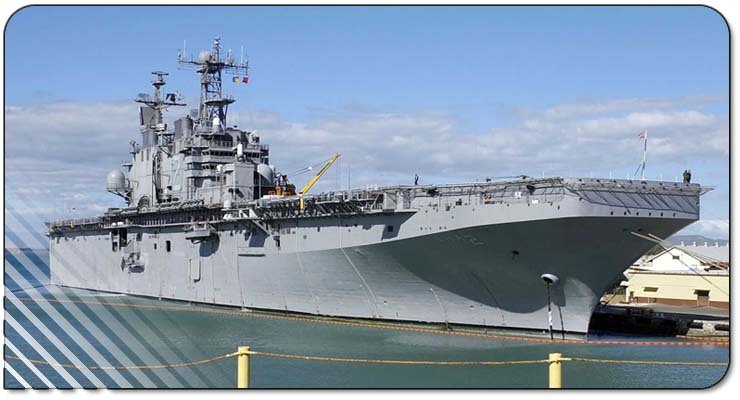 The ship returned to Norfolk on 10 September 1993, and entered Norfolk Naval Shipyard for her third scheduled complex overhaul on 29 April 1994. SAIPAN has since deployed twice more to the Mediterranean, in 1996 and 1998. SAIPAN's awards include the Armed Forces Expeditionary Medal, Navy Expeditionary Medal (two awards), Humanitarian Service Medal, Battle Efficiency "E" (four awards), the Admiral Flatley Safety Award (two awards), the Sledge Award, the Atlantic Fleet Surface Force "Admiral's Cup" in 1985, COMPHIBRON Twelve's "Bronze Anchor" for retention excellence, and the 1993 COMNAVSURFLANT Command Excellence Award for Command and Control, Maritime Warfare and Logistics Management. 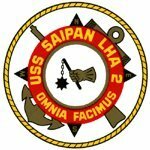 SAIPAN's motto, "Omnia Facimus" - "We do it all" - aptly describes the unique capabilities and history of this very special ship. Description of Coat of Arms:The design of the ship's crest reflects the unity of the Navy/Marine Corps team. This is shown by the outer circle superimposed on a rifle and anchor. The cardinal points of the compass represent the freedom of movement enjoyed by amphibious units in responding to all situations. The iron gauntlet holding the mace depicts the striking power of the embarked Marines. Omnia Facimus translates to "we do it all." More than a boast, it was soon to become a statement of fact for Saipan and her crew.